Potter was referring to the threat of ag-gag laws. “Ag-gag” is a term coined to describe a variety of existing and proposed laws that seek to “gag” or prevent whistleblowers from exposing abuses and crimes within the animal agriculture industry. Although three similar laws, more broad in scope than simply recording, were passed in Kansas, Montana and North Dakota as early as 1990 and 1991, since 2011 a variety of ag-gag bills have been introduced around the country in an attempt to censor whistleblowing by investigators, journalists and advocacy organizations who seek to expose animal welfare or labor abuses in factory farms and slaughterhouses. The meat and dairy industries have long tried – and often succeeded – in operating without transparency and leaving consumers in the dark. These industries have pressed lawmakers for years to inflict severe penalties on anyone that may threaten profit motives by exposing their exploitation. In the face of growing pressure from the meat and dairy industries on legislators to pass ag-gag laws, investigations by animal advocacy organizations, such as the Humane Society of the United States, Mercy for Animals and Compassion Over Killing, have exposed shocking animal cruelty and consumer health dangers in the food industry that would have otherwise gone unreported. There have been dozens of these undercover employment-based investigations of the meat, dairy and egg industries by animal protection groups over the past fifteen years. These investigations have led to a felony conviction for egregious cruelty to animals,2 the country’s largest meat recall ordered by the USDA in 2008,3 a civil settlement of $497 million by a California slaughterhouse,4 and international media exposure to the plight of animals and workers on factory farms. The investigations have also led to improved conditions for farm animals, laws against a range of animal confinement systems in nine states, and corporate farm animal welfare policies from most of the country’s largest fast-food restaurants, grocery chains and meat companies, including McDonald’s, Burger King, Smithfield Foods and Hormel. In 2011, the meat industry responded – not by improving conditions for farm animals, but by proposing ag-gag laws in four states to prohibit investigations into abuses and crimes within the animal agriculture industry. The first law of its kind passed that year in Iowa. In 2012, pro-factory farm legislators enacted three such laws in Missouri, Utah and South Carolina. In 2013, fifteen anti-whistleblower bills were introduced in eleven states (Arkansas, California, Indiana, Nebraska, New Hampshire, New Mexico, North Carolina, Pennsylvania, Tennessee, Wyoming, and Vermont). None passed. 2014 saw another six such bills proposed, with one passing in Idaho. Many of these bills have their origins5 in model legislation drafted by the American Legislative Exchange Council (ALEC), the conservative think tank that has been behind a variety of legislative campaigns, including “stand your ground” gun laws and laws mandating states to teach climate change denial in schools. In 2002, ALEC introduced model legislation, called the “Animal and Ecological Terrorism Act,”6 which labels people who film animal operations as “terrorists” and criminalizes such actions. 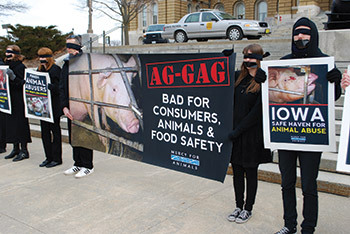 In 2004, ALEC began pushing the legislation, and many state “ag-gag” bills have since borrowed language from it. Requiring those who witness animal abuse to report the incident within such a short time frame that it is nearly impossible to document any long-term or widespread patterns of abuse. 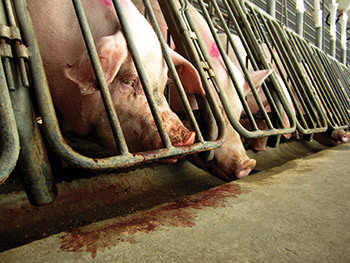 Most pigs exploited for breeding purposes in the pork industry are confined in crates where they can’t even turn around. Photo credit: The Humane Society of the United States. A wide variety of welfare, civil liberties, environmental, food safety and First Amendment organizations have publicly stated their opposition to ag-gag laws. Some of these groups include: American Civil Liberties Union, Animal Legal Defense Fund, American Society for the Prevention of Cruelty to Animals, Amnesty International USA, Farm Sanctuary, Food and Water Watch, Food Chain Workers Alliance, Humane Society of the United States, Humane Society Veterinary Medical Association, International Labor Rights Forum, Organic Consumers Association, National Consumers League, and United Farm Workers, among many others. Not only do ag-gag laws help to perpetuate animal abuse on industrial farms, they also threaten workers’ rights, consumer health and safety, and the freedom of journalists, employees and the public at large to share information about something as fundamental as our food supply. Rather than criminalize undercover investigations in the meat and dairy industries, we should be celebrating them – such investigations were the impetus for many of the nation’s food safety laws. Public knowledge of the practices that Sinclair brought to light in The Jungle led to the passage of the Federal Meat Inspection Act and the Pure Food and Drug Act in 1906. More recently, Michael Pollen’s exposé of the fast-food and meat industries galvanized a new movement around issues related to food safety and sustainability. Over time, increased public awareness has led to stronger food safety laws that help protect the public from “mad cow” disease, E. coli, Salmonella and more. Ag-gag laws pose a grave threat to everyone, especially those of us who envision and work towards a more sustainable food system and a more just economy. Ag-gag laws are an attempt to keep consumers in the dark about what they are buying – and they do that by criminalizing anyone who seeks to understand or expose the truth, allowing the agriculture industry to maximize profits at the expense of animals, workers, food safety and the environment.